Making vegetable broth is one of those things that’s really easy to do, but I bet most of us don’t do it. Or, at least, don’t do it often. I use vegetable broth in a lot of my recipes, but I’ll be honest, I often use store-bought broth. But I shouldn’t because making your own vegetable broth is so, so easy. And you know what else? It tastes so much better too. Onions (or a member of the onion family–leeks or shallots work too), celery, and carrots. That’s your starting point, but from there, you can tailor your broth to what you’re going to be using it for. Add sprigs of thyme and parsley to make a cooking liquid for rice and other grains. If you’re going to be using the broth as a base for an Asian-inspired soup (like this Thai Red Curry Soup), try adding fresh ginger and lemongrass. But really, you can use so many different things. You do want to stay away from cruciferous veggies–no cabbage, no broccoli, no cauliflower, and for the love of all things holy, no brussels sprouts–because they can leave bitter flavors in your broth. Make sure everything you use is clean too–you don’t want to make dirt soup! And remember, there’s a difference between things you don’t want to eat vs. things you shouldn’t eat. Clean carrot peel is fine in a broth or stock; a moldy carrot is not. Oh, and speaking of stock! 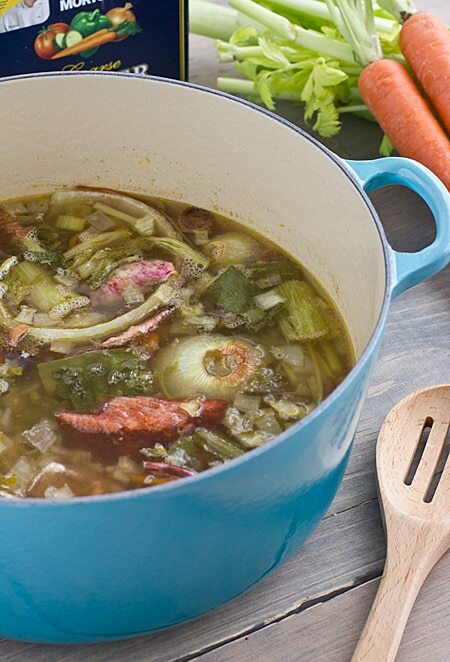 Have you ever wondered the difference between vegetable broth and stock? Broth is seasoned, while stock is not. So this recipe can be used for both vegetable broth or stock. To make stock, skip adding salt and pepper at the end. 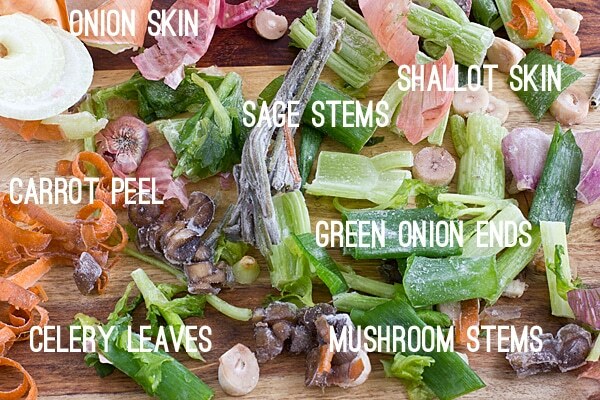 Don’t throw away those vegetable scraps! 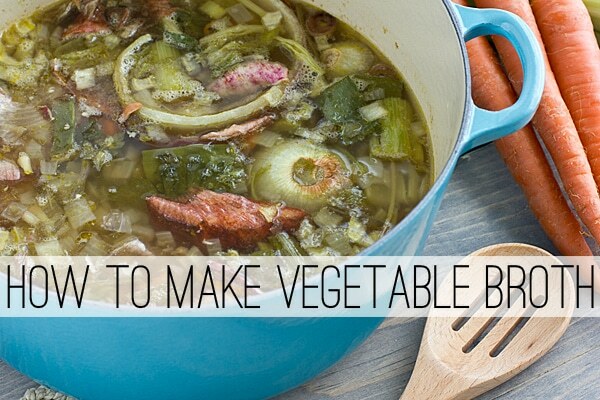 Use them to make your own delicious vegetable broth instead. It’s easy and it’s so much cheaper than buying broth at the grocery store. This post was originally published on January 8, 2013. Should it be brought to a boil before the heat is turned to low? Looking forward to making this! Yup, you’ll want to bring it to a boil first. I hope you enjoy it! I just made this and my wife brought up a good point… Normally you peel things so you don’t have to scrub and wash them to remove the dirt/pesticides/etc. Shouldn’t you be concerned about pesticide residue in the broth after cooking? I would give everything a good cleaning before adding it to the broth, and if you’re still concerned you could stick with organic produce. When making vegetable stock, do most of the nutrients from the veggies leach into the stock so that it would have the same nutritional value (minus the fiber) as if you’d left the veggies in? Thank you for this. Hi Anita! I would think some do, but I doubt all of the nutrients end up in the broth. I can’t say for sure though! Start with cold water to deglaze the onions and aromatics. Try for a 2 parts onion to one part carrot and one part celery for a balanced flavor. Do not boil, you want slight simmer of bubbles around the edge of the pot. boiling will tear apart the fibers and make your broth more cloudy and do not stir during the simmer process. I always strin in colander and then strain a second time in fine mesh sieve. Happy eating. Thank you for this information!!! is it bad to use kohlrabi for vegetable broth ? Kohlrabi is part of the brassica family – and she suggests avoiding all of those – brussel sprouts, broccoli, cauliflower, kale, rutabaga, collard greens, turnip, cabbage and most mustards. I think it would work in a slow cooker. I’d have to guess at the time, but I’d say around 4 hours on high, or about 8 on low. Has anyone ever used corn cobs for this broth recipe? I”m wondering if corn milk released would make the broth cloudy and therefore not suitable…. I cannot tell you how much this tip has helped me. I always keep a broth veggie bag in the freezer now. Thank you so much. This is such a money saver. Should choose fresh vegetables, but I really like your idea. 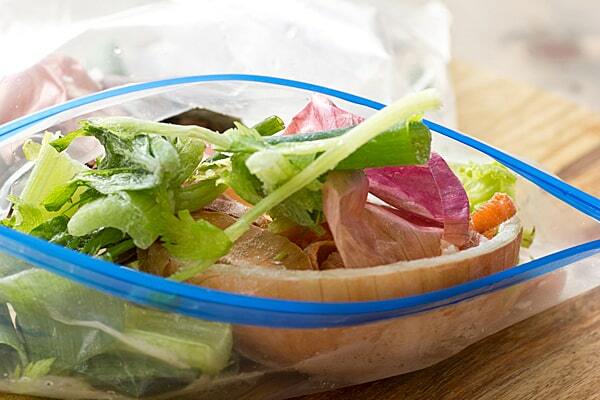 What a great idea….keeping scraps in the freezer. I have never even thought about this until I saw a soup recipe that called for homemade vegetable stock, did a search for it and found your site. Can’t wait to try it! Thanks for sharing! making this now using scraps I saved in freezer for like a month – I think I have too many veggies, but we’ll see. Do you think this would work using the veggie “pulp”from my juicer? If I just make veggie juice – with carrots, celery, beets, kale or other greens? Rather than straining this can I just zap it with the blender and enjoy????? Apologies in advance if thats a daft question!! My broth separated when I thawed it (particles/sediment vs liquid) . Is it still ok to use? Yes, it should still be okay to use, but if it smells spoiled it’s best to play it safe and throw it away. Assuming there is no odor, you can run your broth through a fine sieve to remove any unwanted sediment. What if the majority of my scraps are tomato and cucumber and various fruits? Like when I make myself a huge salad, can those scraps be used as well? Hi Ruth! While there’s no rule against it, typically tomatoes and other fruits are avoided because those flavors often clash with those of the scraps. Also, due to the high sugar content in many fruits, there’s also an increased risk of the broth spoiling prematurely. This is a really great idea! I’ve been wanting to make homemade veggie stock for a while, but thought it was a huge process. Now that I know that it’s not, I’m totally going to try it. How long should this last in the freezer? A tip for some people worried about using scraps for there broth, I put scraps in the food processor, and mix it in with my dogs’ food. They love it! Hi Tiffany! Frozen broth should last you about three months in the freezer, so you’ll have plenty of time to use it up! I rate the overall recipe 5 stars. I’m making it now. insecticide (even on organic, after leaving the field), bodily fluids and may be washed with dirty water. I can remember when, in South Texas, the dirt was washed off in the irrigation ditches. Fruits and vegetables that I am going to eat raw, I wash in a mild soap and bleach solution. Do you think workers in third world countries adhere to US food practices? If you can’t stand to throw out peels, compost them and put around your plants, houseplants or yard and garden plants. I have looked for a good Vegetable Broth recipe, even using scraps, but they just didn’t compare to this one. I am sharing it along with the adjustments I made with my family and friends. Thank you for very helpful tips!